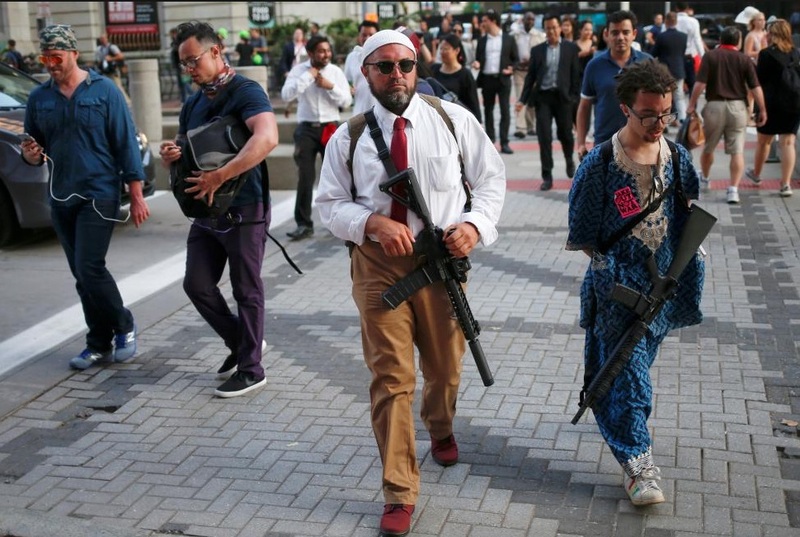 These half-baked advocates of open carry are patrolling the streets of Cleveland, Ohio with assault weapons during the Republican convention. Meanwhile thousands of schoolchildren, mothers with prams, people bustling to work go about their business unarmed. Even as gunmen take to shooting & running down people in malls, schools, nightclubs, & public streets, is this the answer? Or is it possible to consider militarism & machismo gun culture as scourges to be addressed? The historic imperative remains: rebuild the international antiwar movement & make our world safe for our children to come of age in, to live & love in. This is a section of the Israeli apartheid wall closing in the West Bank. The people in the scene are part of Netanyahu’s security personnel & entourage after a media briefing. 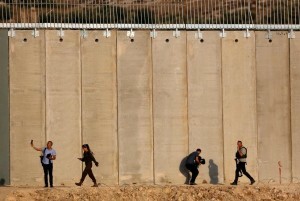 Curious thing about that apartheid wall: it only closes Palestinians in but not Israeli settlers out of the West Bank. A similar version of this monstrosity crawls along the US border with Mexico. Drumpf wants it higher & more impenetrable. There are versions of this wall all over the world made of cement, razor wire, steel & monitored with drones, high-tech surveillance equipment & border guards. It’s become a planet of barriers between human beings & against human rights & democracy. How has the world come to this!? More importantly, how can we stand together to reverse this aesthetic assault, violation of human rights, expression of rancid xenophobia & complete lack of democracy? 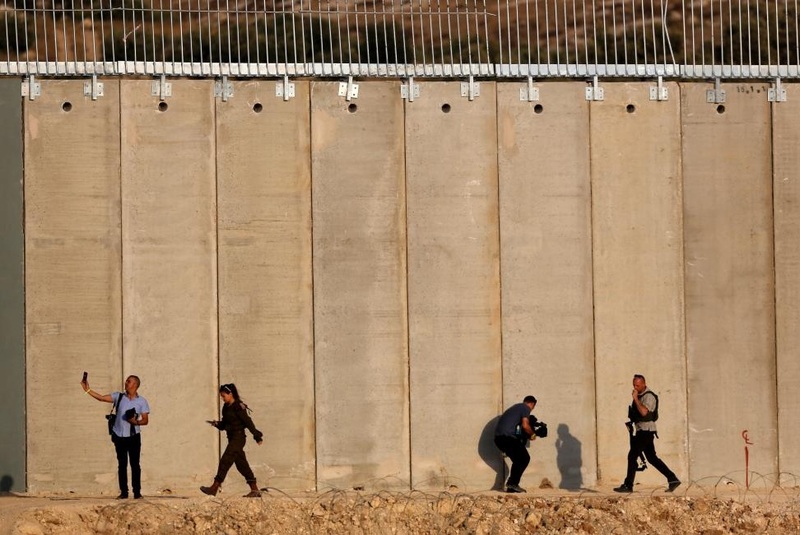 Building BDS is one way to address the apartheid wall in Israel. 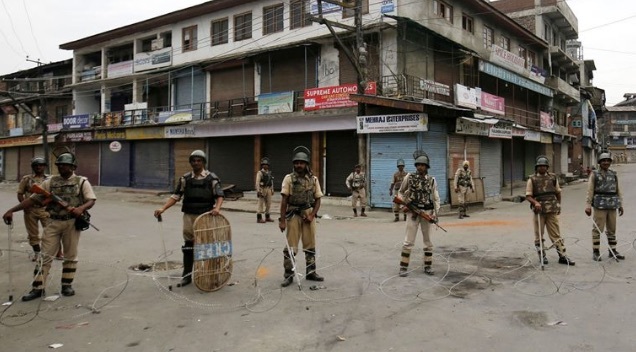 After reading five articles on FB censoring posts in solidarity with Kashmir, I did an internet search & came up with a page of articles from around the world. The articles are a repetition but reach vast numbers of readers. It’s a way to break the news barrier. After three days, the petition has under 1,000 signatures and a long way to go. But Facebook censoring is making the news around the world, including in the Guardian-UK, Dawn.com, The Express Tribune, Yahoo, The Bangkok Post, Nation.com, The News.com, Daily Star, Gulf Today, plus several blogs. 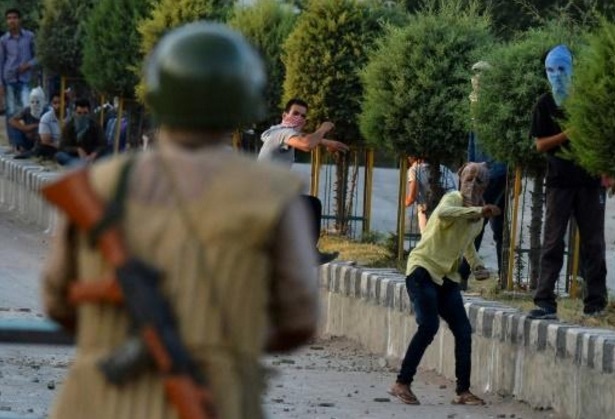 Media isn’t reporting the details of the curfew in Kashmir but only that it has been in force since July 9th. India has imposed restriction of movement which entails restriction on access to vital services. What if you require emergency medical treatment during the curfew period? If you try to get to a hospital will the Indian army shoot you down? Consider what it means that a government allocates to itself the power to lock in an entire population like they were recalcitrant children. But of course it’s only done to prevent public gatherings to protest the occupation. That’s how afraid the Indian government is of democracy. Photo is streets of Srinagar under curfew. Clinton is making hay on Drumpf’s hate-mongering by calling for love. We can call her the love bomb candidate. She’ll drop those bombs but she’ll be doing it with love. And that kind of rhetorical crap is the only difference between Democrats & Republicans. Several years ago, a Black schoolteacher in the US set off a furor over Mark Twain’s 1885 book “Huckleberry Finn,” which was part of the core curriculum in elementary school. In teaching the book to Black children, he saw they were traumatized by the book & not just by its use of the n-word. To most white readers, Huckleberry Finn is an inspiring, anti-racist book & the furor completely threw many of them for a loop. Once you understand it as one of the earliest examples of white savior literature–along with Rudyard Kipling’s 1888 novella “The Man Who Would Be King”–the book’s artistic problems are clarified (in particular its odious ending); Twain’s racism becomes evident; & the book develops a distinct malodor. It speaks to the cognitive disorders of white supremacy that white readers are not immediately repulsed, as the Black schoolchildren were, that a puckish white street kid would save an adult Black man from slavery. This controversy has not abated cinematic outpourings of white savior films which usually involve leading white & Black actors. Accidental & reflecting the racism of Hollywood? Or intentional social control to inculcate racism & supremacy? This comes to mind because one TV station just showed two films about the anti-apartheid struggle in South Africa & in both a white savior is the leading character & Black anti-apartheid activists merely props to showcase white nobility. The genre clearly appeals to whites. It must be deconstructed & undone.